Although I’m a vegetarian, I do still cook meat dishes for others from time to time. The grocery store I stopped at on the way home from work (Carlie C’s) didn’t have any “flank steaks” specifically, so I purchased two different types of steak in the thinnest cuts I could get. Here’s where the vegetarian in me strikes: I don’t remember what they were. Sorry! 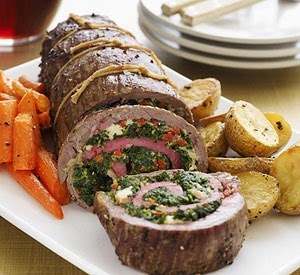 The guys loved them, especially with the spinach and blue cheese stuffing. Feel free to check out my latest Pinterest board, Manfriend Meals, for more ideas that are sure to please any hungry man.